One of the great myths about the reign of Turkish Prime Minister Erdogan and his AKP Party is that they were substantially better for religious freedom than their Kemalist predecessors. This line was even adopted within Greek Orthodox circles. While Sunni Muslims in Turkey may be experiencing more freedom of religion, we should ask the following about Erdogan’s time in power: Is Halki graduating – or even educating – seminarians? Are historic churches still being converted into mosques? Have liturgies been stopped in occupied Cyprus? Have the Greek Orthodox bishops of the occupied areas been able to minister freely to their flock? Is the conversion of Hagia Sophia a leftover of the Kemalist era, or a Erdogan/Gulenist agenda item? Honest answers to all these questions prove that not only has there not been substantial progress on religious freedom for Turkey’s Christian minorities, but in many ways there has been backsliding. 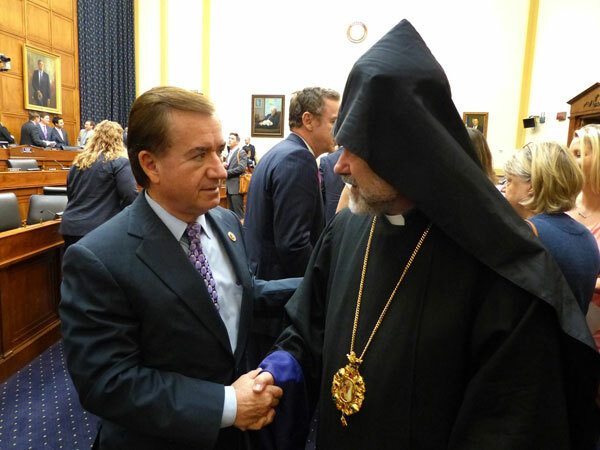 Chairman Ed Royce with Armenian Bishop Anoushavan Tanielian in the Committee hearing room. This week, the House Foreign Affairs Committee signaled that it has had enough with low key nudging of Turkey over religious freedom. In April, Committee Chairman Ed Royce (R-CA) and Ranking Democrat Eliot Engel (D-NY) introduced H.R. 4347 – the Turkey Christian Churches Accountability Act — requiring the Secretary of State to provide an annual report to Congress regarding United States Government efforts to survey and secure the return, protection, and restoration of stolen, confiscated, or otherwise unreturned Christian properties in the Republic of Turkey and in the Turkish occupied northern part of Cyprus. The Act was brought before the Foreign Affairs Committee on Thursday. The Turkish lobby launched a campaign to block H.R. 4347. Turkey used every trick in the book – from claiming progress on religious freedom, to raising the crisis in Iraq, to threatening its relationship with the United States. When Turkey and its lobby saw it couldn’t block the bill, they had the co-chair of the Turkish Caucus, Congressman Gerald Connolly of Virginia, introduce an amendment gutting the entire act and speaking only of the progress made by the Turkish government and its commitment to further progress on religious freedom. The Committee was not impressed. Congressman Chris Smith of New Jersey responded to Turkey raising its alliance with the US as an issue by saying, “Friends don’t let friends commit human rights abuses.” Congressman Brad Sherman of California recalled Turkey’s threats against the French Parliament when it considered Armenian Genocide legislation and declared, “We should not be dissuaded by [Turkey’s] bluffs, and this Committee should show at least the fortitude of the French Parliament.” Congressman Engel rejected the reasoning for the Connolly amendment, saying “Turkey can’t have it both ways. They can’t claim to be an ally and. . .immune from criticism, and [then not be there when we need them. ]” In the end, the Connolly amendment was decisively defeated. The main amendment to HR 4347 was the incorporation of Congressman Bilirakis’s previously proposed legislation, calling upon the Government of Turkey to facilitate the reopening of the Ecumenical Patriarchate’s Theological School of Halki without condition or further delay. Congressman Bilirakis’ work was acknowledged by Chairman Royce in his opening statement. Advocacy efforts on H.R. 4347 were led by the Armenian National Committee of America (ANCA). The Hellenic American Leadership Council (HALC) worked closely with ANCA over the past year on the Act, and it launched a Contact Congress campaign through which 369 members of the House were emailed and called by thousands of constituents. PSEKA, the Coordinated Effort of Hellenes, the American Hellenic Council, AHI and AHEPA also all supported H.R. 4347. “As we get ready to commemorate the 40th year since Turkey’s illegal invasion and occupation of the northern part of Cyprus, it is important to remember one legacy of that occupation is the destruction and desecration of over 500 churches and the oppression of Christianity,” said Philip Christopher, President of PSEKA. H.R. 4347 now has to be considered by the full House of Representatives and be voted on by the U.S. Senate. Turkey’s Foreign Ministry issued a statement demanding a statement of opposition to the Act from the Administration, and the Turkish lobby has vowed to fight the Act on the floor of the House. Previous article The Magic of Greece! Let’s Go to Greece This Summer!